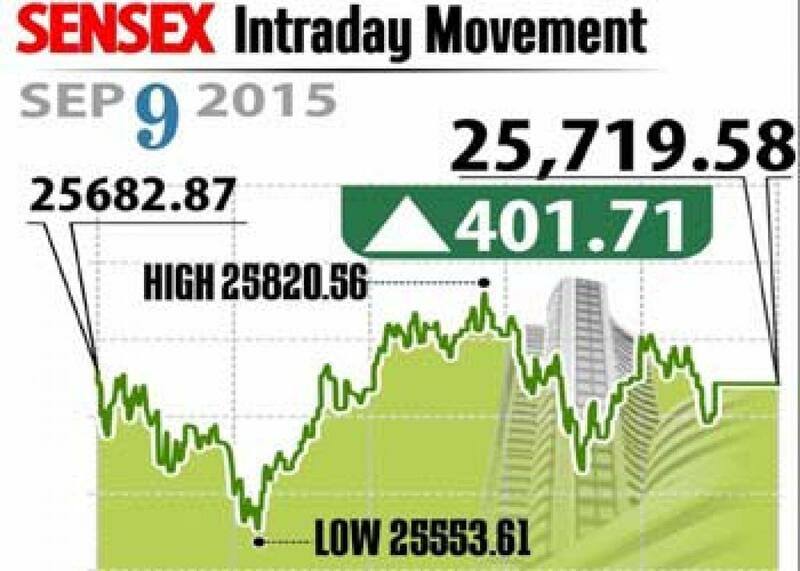 Markets surge on global cues. A surge in the global markets that lifted investor sentiment in the stock markets as the bulls rallied for the second day helping benchmarking indices to reclaim crucial levels. Mumbai: A surge in the global markets that lifted investor sentiment in the stock markets as the bulls rallied for the second day helping benchmarking indices to reclaim crucial levels. Sensex pushed over 800 points in two days as Chinese markets get stable while Japan's Nikkei recorded highest single day gains. BSE Sensex jumped 402 points higher to end at 25,720 and Nifty zoomed 130 points to close at 7,819. Also the broader markets fared in tune with its index majors with midcap and smallcap indices gained about 2 per cent each. All the sectoral indices closed in the positive with realty, auto and metal indices ended over 3 per cent, each. Following cabinet push for gold bond and gold monetisation schemes, the gold players Gitanjali Gems, Shree Ganesh Jewellery, PC Jeweller and Rajesh exports jumped up to 15 per cent. In another cabinet push, the share of the telecom service providers gained as the government released guidelines to buy and sell of radio waves from each other. The companies like Bharti Airtel, Reliance Communication and Idea Cellular gained up to 12 per cent. From metals pack, JSW Steel, Vedanta and NMDC shares raised between 3 to 10 per cent, while auto stocks M&M gained 2 per cent higher as the company's acquisition of Italian car designer Pininfarnina in the next two weeks. Bank stocks closed higher with Axis Bank, Yes Bank, IndusInd Bank, Canara Bank and PNB increased up to 4 per cent. The gainers: Hindalco Industries, up 7.97 per cent at Rs 78.60; Vedanta, up 6.85 per cent at Rs 99.85; NTPC, up 5.50 per cent at Rs 120.85; Tata Steel, up 4.57 per cent at Rs 239.25; and Tata Motors, up 3.98 per cent at Rs 344.90. The losers: Sun Pharma, down 0.63 per cent at Rs 840; Gail, down 0.39 per cent at Rs 293.90 and Wipro, down 0.23 per cent at Rs 561.